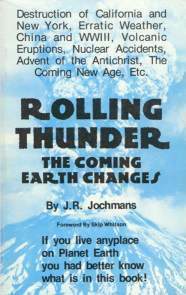 ROLLING THUNDER: THE COMING EARTH CHANGES by J. R. Jochmans. The Coming Famine and Earth Movements, The Destruction of California and New York, Future War, Nostradamus, Bible, Edgar Cayce, Coming Avatars, Pyramid Prophecy, Weather, Coming False Religion and the Antichrist, and much, much more! This book is currently our best selling title. 240 pgs. 5x8. Paperback. ISBN: 0-89540- 058-8. $15.00.